A groundbreaking ceremony was held Wednesday for the 70-unit Village at Los Carneros affordable-housing project in Goleta. By Brooke Holland, Noozhawk Staff Writer | @NoozhawkNews | October 12, 2016 | 9:43 p.m. 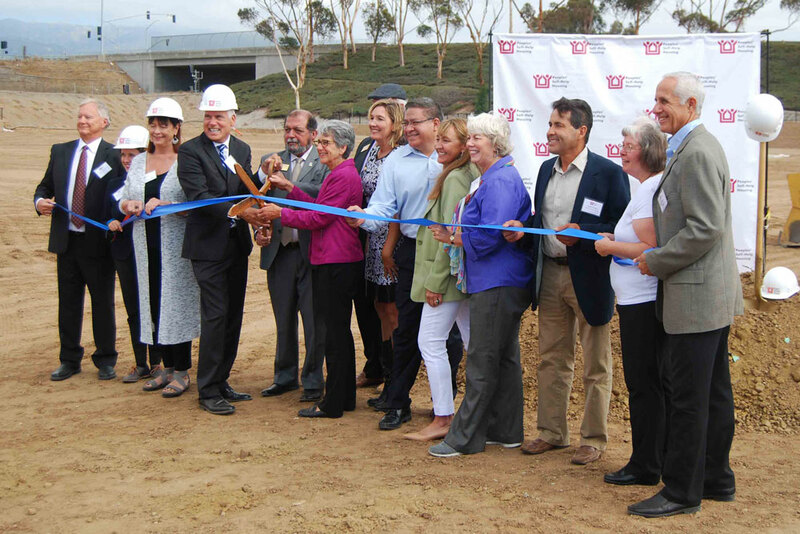 The roar of heavy machinery echoed in the background Wednesday as Peoples’ Self-Help Housing officials and community leaders officially broke ground on a new 70-unit affordable-housing development in Goleta. Several community leaders and PSHH representatives strapped on hard hats and shoveled a pile of dirt to signify the beginning of construction on the 3-acre property. PSHH President and CEO John Fowler said he hopes to begin the $13 million Village at Los Carneros project before November. Plans for the housing facility call for one- to three-bedroom apartment units ranging from 736 to 1,075 square feet. It is designed to serve 70 families, and monthly rental prices span from $700 to $1,000, Fowler said. PSHH provides affordable housing to low-income families, seniors and other special needs groups, Fowler said. Located north and west of Los Carneros Road, just south of Highway 101, the development serves households earning no more than 60 percent of the area median income, Fowler said. Fowler said the development was a partnership between the Goleta Valley Housing Committee, J.P. Morgan Chase, Merritt Community Capital and the city of Goleta. The affordable-housing units mark a significant step forward, said Kristen Miller, president and CEO of the Goleta Valley Chamber of Commerce. The Village at Los Carneros is under construction, and will feature a mix of single-family homes, duplexes, triplexes, four-plexes, town homes, condominiums and apartments. The development includes a community center, multi-purpose room, youth education center, management offices, two on-site laundry facilities, outdoor recreation space and a half basketball court. The council unanimously approved the design for the roughly 40-acre site in February 2015. Councilmember Roger Aceves said the board was dedicated to finding the opportunity to build partnerships and create local affordable housing. PSHH is a private community based non-profit organization that serves 25 communities throughout San Luis Obispo, Santa Barbara and Ventura counties. The Village at Los Carneros property is PSHH’s fourth project in Goleta. The organization also oversees the Ellwood Apartments, Storke Ranch Apartments and Villa La Esperanza. Fowler said he is excited PSHH is growing and creating more opportunities to support families in Santa Barbara County. In June, PSHH acquired a property at 510 N. Salsipuedes St. in Santa Barbara. The building is designed for low-income residents who make roughly $19,000 to $40,000 annually and features 40 units, according to Fowler. Jardin de las Rosas is expected to open in fall 2017, Fowler said.